Welcome to the 4th week of summer! A few crops are doing incredibly well this season, and a handful are struggling somethin’ fierce. You win some, you lose some, right? We’re lucky to be getting good gentle rains these days, as it will surely help, but remember the past two months? All of May and June we didn’t get a drop. It’s super rare in East Texas to go all of May and June with no thunderstorms or rain of any kind. Those are usually our two wettest months. Combine that with several-week-long stretches of upper 90’s temperatures so early in the season, and our young tender plants were super stressed. 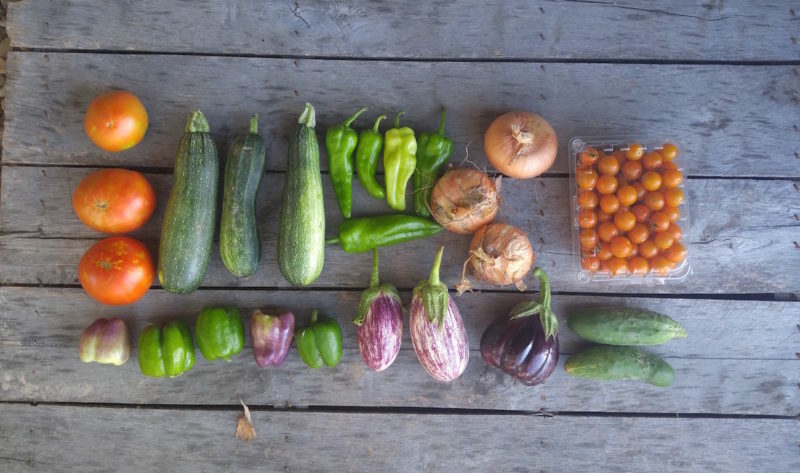 This resulted in smaller early-season yields so the shares have been smaller than we’d like, but we’re expecting some more good things from the garden soon. Thank you for coming along for the ride with us, CSA members!! Eggplant—The large shares received a couple of dark purple Italian Eggplant and the small shares received our lovely and tiny Fairy Tale Eggplant. There are a handful of really great eggplant recipes in our kitchen blog. We enjoyed ours in a veggie lasagna this week. This is one of our crops struggling under the unseasonable dry and hot conditions of June. They’ve been well fed with our organic fertilizer and compost tea, and we’ve carefully managed their water intake and now we’re hopeful they begin to really thrive for you after this stretch of cool weather and rainy afternoons this past week! Cucumbers—This crop is going absolutely bonkers in the garden this year. We can hardly keep up with picking them. 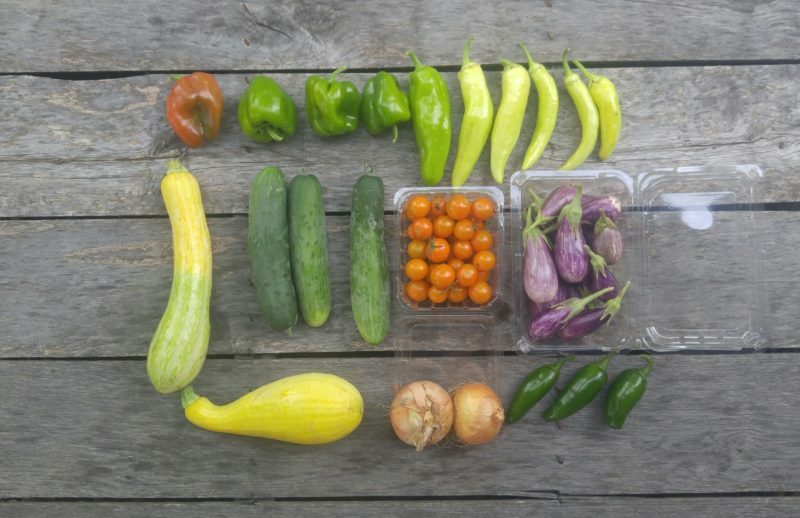 This week some of you received a slicing variety and a few received a pickling variety or even an English cucumber. These are particularly fun- long, slender, sometimes curvy, and spiney! Yellow squash—These plants are also really thriving. We aren’t sure why their neighbors, the closely related zucchini just one row over aren’t doing so hot. We’re really babying the zucchini and hopeful that they’ll be producing well for you soon. Sungold cherry tomatoes—This crop is really growing strong. We had enough for all small shares to receive a pint and all large shares, a quart! Sweet bell peppers—We grow all sorts of pretty colors of bell peppers. Each has a slightly different flavor, so I hope you get to try them all throughout the season. We aren’t getting a ton of fruits right now from these plants. They won’t set new fruits when the overnight temps are above 75 and we’ve nearly picked all of the early fruits off already. We hope the cooler temperatures and mid-season feeding we did 2 weeks ago will be providing them with the boost they need to produce a heavy load a few weeks from now. Italian Frying Peppers—These are crisp and sweet, similar to a bell pepper. They’ll be great sautéed, or blistered and roasted in the oven, but I really like them raw. Their situation is the same as the bell peppers. A few weeks from now, we hope they’re happy again. Onion—When our other crops are struggling, we can always count on our crisp, sweet yellow onions to be there for us. Our soil grows really amazing onions! Hot Peppers—Jalapeño Small shares only. These have a wonderful flavor and nice amount of heat. Enjoy in any dish you need to spice up. Slicing tomatoes—The Large shares received the first harvest of slicing tomatoes! This week the tomatoes are all from our Big Beef variety. We tried to not give out very many green tomatoes, but you likely received a couple that are still a bit orange or have green shoulders. Just set them on the counter, shoulders down, and they’ll be ready in a few days. Remember to never refrigerate your tomatoes! This crop is just coming on, so we’re excited to see how they do over the next month. Onions and tomatoes will all prefer to stay at room temp. Tomatoes especially will begin to get mealy if stored any colder than 55 degrees. 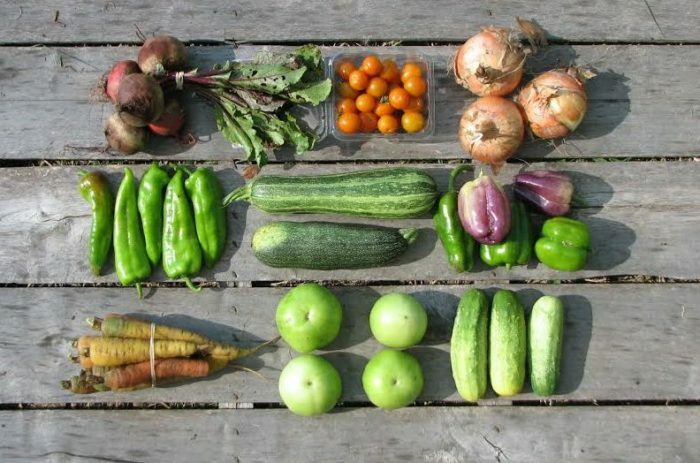 The squash, cucumbers, eggplant, and peppers like to be cool but not cold. They can be stored at room temp if you’ll be eating them fairly soon, otherwise put them sealed up in the fridge if you won’t be getting to them for a few days. Everything will need a gentle washing before cooking, but leave the dirt on until you’re ready to use them to prevent faster spoilage. 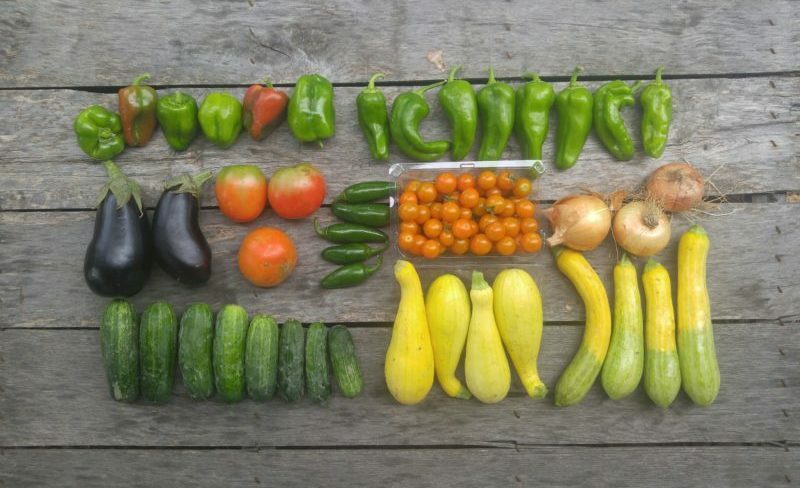 Large Share Large Share: (from top left) Bell Peppers, Italian peppers, (next row) eggplant, slicing tomatoes, jalapeños, Sungolds, onions (bottom row) cucumbers, Crookneck Squash and Zephyr Squash. 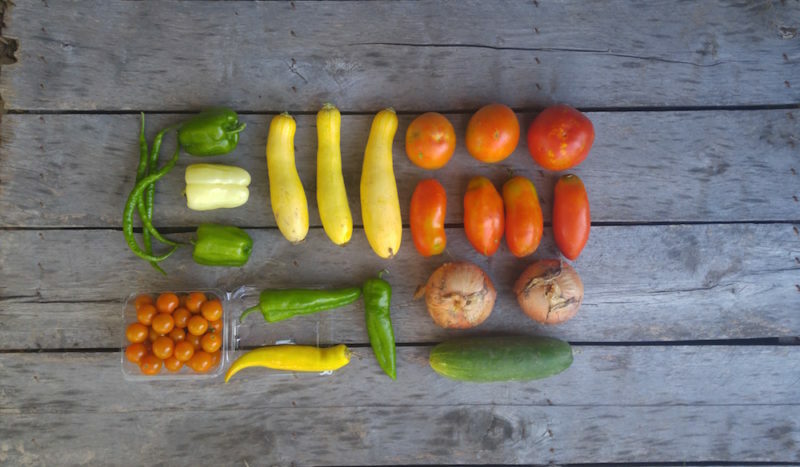 Small share: (top row) Bell Peppers, Italian Peppers, (next row) Zephyr Squash, cucumbers, Sungolds, Fairytale Eggplant (bottom row) Crookneck Squash, onion, and jalapeño.